A Quilter's Table: 3058 and Counting . . .
Oh NO!!! You sure started something here.....Good luck! !?! And I thought 115 was a lot! Yikes! So when is round 2? That is just insane! In a very, very good way of course! Have fun!! wow. Did you think it would be this big?! I'm so looking forward to my blocks. Best to you as you sort them! My stars in the morning :) WOW!! Your fingers must be numb :) But I bet they are sure pretty!! Debbie, you are in trouble! I wish I would be closer to help you! Sorry but I'm not quite sure how that swap works - are all those blocks at your home? and now what? Wow! That's a lot of blocks to keep track of! Hope you have some help. I said you were brave to take the swap on back in July when we first chatted about the details and with 3K+ you've certainly earned that remark. It's going to be epic and the projects to follow unforgettable. Epic is right. I do not envy your sorting task. Thank you so much for taking that on. 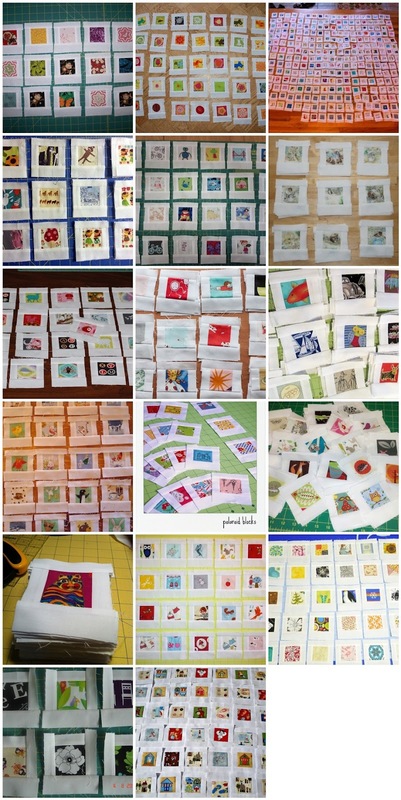 These were so fun to make and it so fun to see all the little snippets of fabric that were being used. I am amazed. When does it stop? This is crazy fun! Oh, my gosh! I hope you can stay sane! And get some help!! holy crap that is a lot!!! awesome! Holy frijoles, that's a lot of blocks! wow, wow, WOW! that is kind of crazy. They are pretty amazing. Where do they all go again? Wow! Thanks for your hard work in sorting and organizing this. This is the first swap I've been a part of and so I'm glad you took the plunge to organize one. Unbelievable...see what madness you've started?! :) You're incredible, Debbie. I wish I were there to give you a hand. You are such a good sport about this, I hope you have some helpers rounded up.